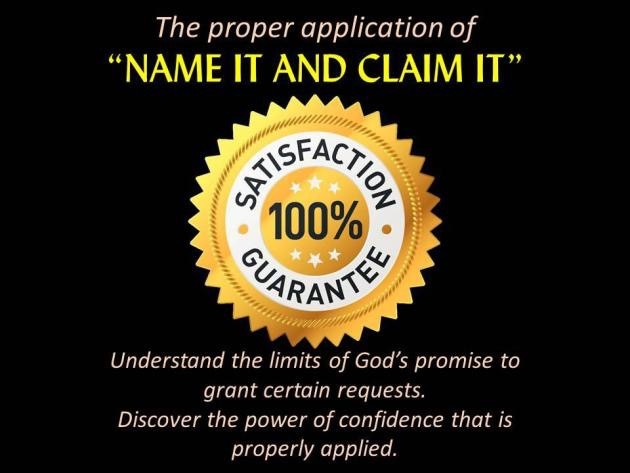 There is an increasingly popular “Christian” philosophy that says “name it and claim it” and you will have it. Those who prostitute this philosophy tell you that you can have anything from perfect health to millions of dollars in your bank account. What about when you “name it and claim it”, and it doesn’t happen? Some might say, “Matthew, you didn’t have enough faith.” I can begin to name countless things that I have believed God for, and He did not give them to me. Is that my fault? God’s fault? Or was it not meant to be? May I ask this? What if “your best life now” involves living in an average house, driving an average car, living paycheck to paycheck, and maybe even wondering where your next meal will come from? What if “your best life now” is lived in simple and humble obedience to God? No one may ever know who you are, but your acts of obedience do not go unseen by God. I want to conclude with a verse that may put this into context for you. I John 5:14 says, “Now this is the confidence that we have in Him, that if we ask anything according to His will, He hears us.” Did you notice the phrase “according to His will”? It may not be God’s will for you to be wealthy. I don’t care what some famous preacher told you. Stick with what GOD said not someone’s twisted interpretation. If you have trouble dealing with the fact that your “prosperity package” never fell out of Heaven, meditate on this verse: “Now godliness with contentment is great gain” (I Timothy‬ ‭6:6‬ ‭NKJV‬). Read the verses surrounding that also. It puts life into perspective. By the way, this was coming from a man who wrote some books of the Bible from a jail cell. Don’t tell me he didn’t have enough faith! He had more than most of us because he was being persecuted for the true gospel rather than enjoying the luxuries of a pimped-out, fake gospel. I remember when this was popular in the 1970s. It leaves out learning to trust God’s will instead of your own. I think God is pleased when we leave everything up to him and not have strong opinions on what is good for us. He is so much wiser than we are. Sure, the name it and claim it and then those who profess to ‘speak it into existence.’ I’ll believe their nonsense if I see them walking on water. Great post about this issue. Will surely be sharing this on Facebook. It’s so important these days. Trials are used to test our faith, and the name-it-claim-it stuff is like turning our Savior into Santa Claus or a vending machine. I think lots of times about your third paragraph. Shared!